Atlanta is the capital and the largest city in the U.S. state of Georgia with a population of 420,003 as of 2010, and is the core city of the ninth most populous United States metropolitan area at 5,268,860. Atlanta has in recent years undergone a transition from a city of regional commerce to a city of international influence, and it has been among the fastest growing cities in the developed world for much of the 1990s and 2000s. Between 2000 and 2006, the metropolitan area grew by 20.5 percent, making it the fastest growing metropolitan area in the nation. In the 1960s, Atlanta was a major organizing center of the Civil Rights Movement, with Dr. Martin Luther King, Jr. and students from Atlanta's historically black colleges playing major roles. Two of the prominent organizations—Southern Christian Leadership Conference and Student Nonviolent Coordinating Committee—were based in Atlanta. The city is a major cable television programming center, including the headquarters of the Cable News Network. 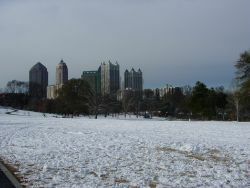 Atlanta's Piedmont Park, with a blanket of winter snow. The city of Atlanta has a total area of 343.0 km² (132.4 sq mi). Located about 1,050 feet (320 m) above mean sea level, it sits atop a ridge south of the Chattahoochee River. Atlanta has the highest average elevation of any major city east of Denver. The Eastern Continental Divide line runs through Atlanta. Rainwater that falls on the south and east side runs eventually into the Atlantic Ocean, while rainwater on the north and west side of the divide ends up in the Gulf of Mexico via the Chattahoochee River. Being at the far northwestern edge of the city, much of the river's natural habitat is still preserved, in part by the Chattahoochee River National Recreation Area. Downstream however, excessive water use during droughts and pollution during floods has been a source of contention and legal battles with neighboring states Alabama and Florida. Atlanta has a humid subtropical climate, with hot, humid summers and mild, but occasionally chilly winters by the standards of the United States. January is the coldest month, with an average high of 52 °F (11 °C) and low of 33 °F (1 °C). Atlanta's elevation ensures it has a more temperate climate than other southern cities of the same latitude. Like the rest of the southeastern U.S., Atlanta receives abundant rainfall, which is relatively evenly distributed throughout the year. Average annual rainfall is 50.2 inches (1,275 mm). Snowfall averages about 2 inches (5 cm) annually. Frequent ice storms can cause more problems than snow. In 2008, however, northern Georgia experienced drought conditions, and most localities imposed water use restrictions as water levels in lakes and streams across the state dropped. In 2007, the American Lung Association ranked Atlanta as having the 13th highest level of particle pollution in the United States. The combination of pollution and pollen levels caused the Asthma and Allergy Foundation of America to name Atlanta as the worst American city for asthma sufferers to live in. Atlanta's skyline is punctuated with highrise buildings, the tallest of which—the Bank of America Plaza—is the 30th-tallest building in the world at 1,023 feet (312 m). It is also the tallest building in the United States outside those of Chicago and New York City. 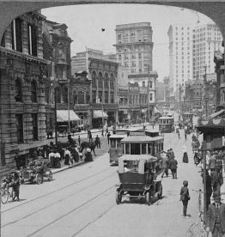 Unlike many other southern cities such as Charleston, Savannah, and New Orleans, Atlanta chose not to retain its historic Old South architectural characteristics. Instead, Atlanta viewed itself as the leading city of a progressive "New South" and opted for expressive modern structures. Panoramic view of the central Atlanta skyline, spanning Midtown (left) and Downtown (right). Atlanta is in the midst of a construction and retail boom, with over 60 new high-rise or mid-rise buildings either proposed or under construction as of April 19, 2006. Atlanta ranks near last in area of park land per capita among cities of similar population density. The city has a reputation, however, as a "city of trees" or a "city in a forest"; beyond the business districts, the skyline gives way to a sometimes dense canopy of woods that spreads into the suburbs. Founded in 1985, Trees Atlanta has planted and distributed over 68,000 shade trees. The city's northern district of Buckhead, eight miles north of downtown Atlanta, features wealthy neighborhoods. It is consistently ranked as one of the most affluent neighborhoods in America. Atlanta's East Side boasts hip and urban neighborhoods. In the city's southwestern section, Collier Heights is home to the wealthy and elite African-American population of the city. 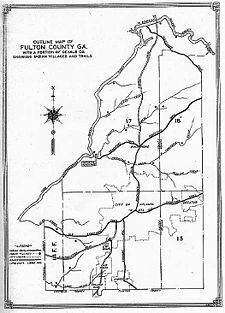 A map showing roads and Indian trails circa 1815, with late nineteenth century Fulton County and City of Atlanta outlines overlaid. Atlanta's Inman Park neighborhood was the city's first planned suburb. Today, it features several mansions and many colorful restored bungalows. 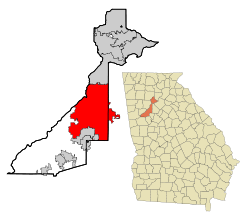 The region where Atlanta and its suburbs were built was originally Creek and Cherokee Native American territory. In 1813, the Creeks, who had been recruited by the British to assist them in the War of 1812, attacked and burned Fort Mims in southwestern Alabama. The conflict broadened and became known as the Creek War. In response, the United States built a string of forts along the Ocmulgee and Chattahoochee Rivers, including Fort Daniel on top of Hog Mountain in present-day Dacula, Georgia, and Fort Gilmer. Fort Gilmer was situated next to an important Indian site called "Peachtree Standing," named after a large tree which is believed to have been a pine tree (the name referred to the pitch or sap that flowed from it). The word "pitch" was misunderstood for "peach," thus the site's name. The site traditionally marked a Native American meeting place at the boundary between Creek and Cherokee lands, at the point where Peachtree Creek flows into the Chattahoochee. The fort was soon renamed Fort Peachtree. The Creek land in the eastern part of the metro area (including Decatur) was opened to white settlement in 1823. In 1835, leaders of the Cherokee nation ceded their land to the government in exchange for land out west under the Treaty of New Echota, an act that eventually led to the Trail of Tears. In 1836, the Georgia General Assembly voted to build the Western and Atlantic Railroad to provide a trade route to the Midwest. Following the forced removal of the Cherokee between 1838 and 1839 the newly depopulated area was opened for the construction of a railroad. It was suggested that the area be renamed "Atlantica-Pacifica," which was quickly shortened to "Atlanta." The town was incorporated as Atlanta on December 29, 1847. The population had grown to 9,554 by 1860. During the Civil War, Atlanta served as an important railroad and military supply hub. In 1864, the city became the target of a major Union invasion. The area now covered by Atlanta was the scene of several battles. Union General William T. Sherman ordered that Atlanta be burned to the ground in preparation for his march south, though he spared the city's churches and hospitals. The rebuilding of the city was gradual. In 1868, Atlanta became the fifth city to serve as the state capital. 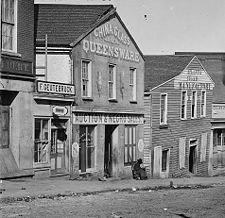 As Atlanta grew, however, ethnic and racial tensions mounted. The Atlanta race riot of 1906 left at least 27 dead and over 70 injured. On December 15, 1939, Atlanta hosted the premiere of Gone With the Wind, the movie based on Atlanta-born Margaret Mitchell's best-selling novel. During World War II, manufacturing such as the Bell Aircraft factory in the suburb of Marietta helped boost the city's population and economy. 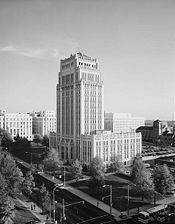 Shortly after the war, the Centers for Disease Control and Prevention was founded in Atlanta. In the wake of the landmark U.S. Supreme Court decision Brown v. Board of Education, which helped usher in the African-American Civil Rights Movement, racial tensions in Atlanta began to express themselves in acts of violence. In the 1960s, Atlanta was a major organizing center of the Civil Rights Movement, with Dr. Martin Luther King and students from Atlanta's historically black colleges and universities playing major roles in the movement's leadership. Two of the most important civil rights organizations—Southern Christian Leadership Conference and Student Nonviolent Coordinating Committee—had their national headquarters in Atlanta. Despite some racial protests during the Civil Rights era, Atlanta's political and business leaders labored to foster Atlanta's image as "the city too busy to hate." In 1961, Mayor Ivan Allen Jr. became one of the few Southern white mayors to support desegregation of Atlanta's public schools. Black Atlantans demonstrated growing political influence with the election of the first African-American mayor in 1973. They became a majority in the city during the late twentieth century, but suburbanization, rising prices, a booming economy, and new migrants have decreased their percentage in the city from a high of 66.8 percent in 1990 to about 54 percent in 2004. New immigrants, such as Latinos and Asians, are also altering city demographics, in addition to an influx of white residents. In 1990, Atlanta was selected as the site for the 1996 Summer Olympics. Following the announcement, Atlanta undertook several major construction projects to improve the city's parks, sports facilities, and transportation. Atlanta became the third American city to host the Summer Olympics. The games themselves were marred by the Centennial Olympic Park bombing. Contemporary Atlanta is sometimes considered a poster child for cities experiencing rapid growth and urban sprawl. However, the city has been commended by bodies such as the Environmental Protection Agency for its eco-friendly policies. Atlanta is governed by a mayor and a city council. The city council consists of 15 representatives—one from each of the city's 12 districts and three at-large positions. The mayor may veto a bill passed by the council, but the council can override the veto with a two-thirds majority. Every mayor elected since 1973 has been black. Maynard Jackson served two terms and was succeeded by Andrew Young in 1982. Jackson returned for a third term in 1990 and was succeeded by Bill Campbell. In 2001, Shirley Franklin became the first woman to be elected mayor and the first African-American woman to serve as mayor of a major southern city. She was re-elected for a second term in 2005, winning 90 percent of the vote. Atlanta city politics during the Campbell administration suffered from a notorious reputation for corruption, and in 2006 a federal jury convicted the former mayor on three counts of tax evasion in connection with gambling income he received during trips he took with city contractors. As the state capital, Atlanta is the site of most of Georgia's state government. The Capitol, located downtown, houses the offices of the governor, lieutenant governor, and secretary of state, as well as of the General Assembly. Atlanta is also the county seat of Fulton County, with which it shares responsibility for the Atlanta-Fulton Public Library System. The city has been on the top 25 most dangerous large cities list, ranking worst in 1994; it is currently ranked as the 17th most dangerous big city. According to crime statistics for Atlanta, crime in the city is well above the national average. The World of Coca-Cola museum reopened near the Georgia Aquarium in 2007. Centers for Disease Control and Prevention, adjacent to Emory University. Atlanta ranks third in the number of Fortune 500 companies headquartered within city boundaries, behind New York City and Houston. Several major national and international companies are headquartered in Atlanta or its nearby suburbs, including three Fortune 100 companies: Coca-Cola Company, Home Depot, and United Parcel Service. 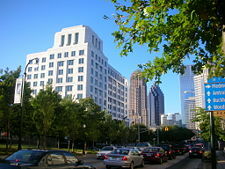 Other headquarters for some major companies in Atlanta and around the metro area include Arby's, Chick-fil-A, Earthlink, Equifax, Georgia-Pacific, Oxford Industries, Southern Company, SunTrust Banks, and Waffle House. Over 75 percent of the Fortune 1000 companies have a presence in the Atlanta area, and the region hosts offices of about 1,250 multinational corporations. As of 2006 Atlanta Metropolitan Area ranked as the tenth largest cybercity (high-tech center) in the United States, with 126,700 high-tech jobs. Delta Air Lines is the city's largest employer and the metro area's third largest. Atlanta has a sizable financial sector. SunTrust Banks, the seventh largest bank by asset holdings in the United States, has its home office downtown. The Federal Reserve System has a district headquarters in Atlanta; the Federal Reserve Bank of Atlanta, which oversees much of the Deep South, relocated from downtown to midtown in 2001. City, state and civic leaders harbor long-term hopes of having the city serve as the home of the secretariat of a future Free Trade Area of the Americas. The auto manufacturing sector in metropolitan Atlanta has suffered setbacks recently, including the closure of General Motors' Doraville Assembly plant in September 2008 as part of the company's cost-cutting measures and the shutdown of Ford Motor Company's Atlanta Assembly plant in Hapeville in 2006. Kia, however, has broken ground on a new assembly plant near West Point, Georgia. The Atlanta metro area is served by many local television stations and is the eighth largest designated market area (DMA) in the United States with 2,310,490 homes (2.0 percent of the total). There are also numerous local radio stations serving every genre. The city is a major cable television programming center. Ted Turner began the Turner Broadcasting System media empire in Atlanta and established the headquarters of the Cable News Network at CNN Center, adjacent today to Centennial Olympic Park. As his company grew, its other channels – the Cartoon Network, Boomerang, TNT, Turner South, CNN International, CNN en Español, CNN Headline News, and CNN Airport Network – centered their operations in Atlanta as well (Turner South has since been sold). The Weather Channel, owned by Landmark Communications, has its offices in the nearby suburb of Marietta. Cox Enterprises, a privately held company, has substantial media holdings in and beyond Atlanta. Its Cox Communications division is the nation's third-largest cable television service provider; the company also publishes over a dozen daily newspapers in the United States, including The Atlanta Journal-Constitution. Atlanta is also home to the Centers for Disease Control and Prevention (CDC), with a staff of nearly 15,000 in 170 occupations, including: engineers, entomologists, epidemiologists, biologists, physicians, veterinarians, behavioral scientists, nurses, medical technologists, economists, health communicators, toxicologists, chemists, computer scientists, and statisticians. Hartsfield-Jackson Atlanta International Airport, the world's busiest airport as measured by passenger traffic and by aircraft traffic, provides air service between Atlanta and many national and international destinations. With a comprehensive network of freeways that radiate out from the city, Atlantans rely on their cars as the dominant mode of transportation in the region. Atlanta is mostly encircled by Interstate 285, a beltway locally known as "the Perimeter" which has come to mark the boundary between the interior of the region and its surrounding suburbs. 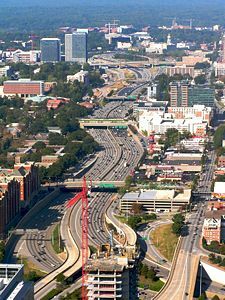 Three major interstate highways converge in Atlanta; Two combine to form the Downtown Connector through the middle of the city. The combined highway carries more than 340,000 vehicles per day and is one of the ten most congested segments of interstate highway in the United States. This strong automotive reliance has resulted in heavy traffic and contributes to Atlanta's air pollution, which has made Atlanta one of the more polluted cities in the country. The Clean Air Campaign was created in 1996 to help reduce pollution in metro Atlanta. In recent years, the Atlanta metro area has ranked at or near the top of the longest average commute times in the U.S. Also the Atlanta metro area has ranked at or near the top for worst traffic in the country. Notwithstanding heavy automotive usage, Atlanta's subway system, operated by Metropolitan Atlanta Rapid Transit Authority (MARTA), is the seventh busiest in the country. MARTA also operates a bus system within Fulton, DeKalb, and Gwinnett Counties. Clayton, Cobb, and Gwinnett counties each operate separate, autonomous transit authorities, using buses but no trains. Atlanta began as a railroad town and it still serves as a major rail junction, with several freight lines belonging to Norfolk Southern and CSX intersecting below street level in downtown. It is the home of major classification yards for both railroads, Inman Yard on the NS and Tilford Yard on the CSX. 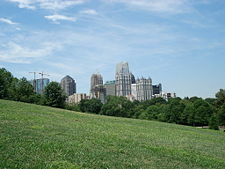 Atlanta's Piedmont Park is the city's largest park. A portion of the park is seen here with the Midtown Atlanta Skyline. As of July 2007, the Atlanta metropolitan area had an estimated population of 5,278,904. The racial makeup of the city was 55.7 percent black, 37.2 percent white, 2.3 percent Asian, 0.2 percent American Indian, 3.7 percent from other races, and .9 percent from two or more races; 5.9 percent of the population were Hispanic or Latino of any race. According to census estimates, Metropolitan Atlanta is the fastest growing area in the nation since 2000 by numerical increase. Atlanta is also seeing a unique and drastic demographic increase in its white population, and at a pace that outstrips the rest of the nation. The white share of the city's population, says Brookings Institution, grew faster between 2000 and 2006 than that of any other U.S. city. It increased from 31 percent in 2000 to 35 percent in 2006, a numeric gain of 26,000, more than double the increase between 1990 and 2000. The trend seems to be gathering strength with each passing year. Only Washington, D.C. saw a comparable increase in white population share during those years. Atlanta is also home to the fastest growing millionaire population in the United States. The number of households in Atlanta with $1 million or more in investable assets, not including primary residence and consumable goods, is projected to increase 69 percent through 2011, to approximately 103,000 households. The population of the Atlanta region spreads across a metropolitan area of 8,376 square miles (21,694 km²) – a land area larger than that of Massachusetts. Because Georgia contains more counties than any other state east of the Mississippi River, area residents live under a heavily decentralized collection of governments. As of the 2000 census, fewer than one in ten residents of the metropolitan area lived inside Atlanta city proper. There are over 1000 places of worship within the city of Atlanta. Protestant Christian faiths are well represented in Atlanta, the city historically being a major center for traditional Southern denominations such as the Southern Baptist Convention, the United Methodist Church, and the Presbyterian Church (USA). There are a large number of "mega churches" in the area, especially in suburban areas. 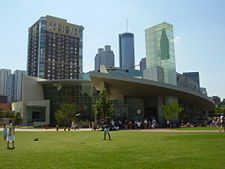 Atlanta contains a large, and rapidly growing, Roman Catholic population which grew from 311,000 in 2000 to 650,000 in 2007. As the see of the 84-parish Archdiocese of Atlanta, Atlanta serves as the metropolitan see for the Province of Atlanta. The archdiocesan cathedral is the Cathedral of Christ the King. Also located in the metropolitan area are several Eastern Catholic parishes. The city hosts the Greek Orthodox Annunciation Cathedral, the see of Metropolis of Atlanta. Atlanta is also the see of the Episcopal Diocese of Atlanta, which includes all of northern Georgia, much of middle Georgia and the Chattahoochee River valley of western Georgia. This Diocese is headquartered at the Cathedral of St. Philip in Buckhead. Atlanta serves as headquarters for several regional church bodies also. The Southeastern Synod of the Evangelical Lutheran Church in America maintains offices in downtown Atlanta; ELCA parishes are numerous throughout the metro area. There are eight United Church of Christ congregations in the Atlanta metro area. The headquarters for the Salvation Army's United States Southern Territory is located in Atlanta. The denomination has eight churches, numerous social service centers, and youth clubs located throughout the Atlanta area. Metropolitan Atlanta is also home to a vibrant Jewish community, estimated to include 120,000 individuals in 61,300 households, making Atlanta's Jewish population the 11th largest in the United States, up from 17th largest in 1996. There also are an estimated 75,000 Muslims in the area and approximately 35 mosques. 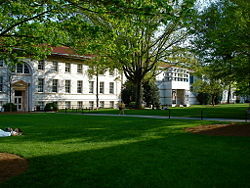 Main Quad on Emory University's Druid Hills Campus. The public school system (Atlanta Public Schools) is run by the Atlanta Board of Education. As of 2007, the system had an active enrollment of 49,773 students attending a total of 106 schools: including 58 elementary schools (three of which operate on a year-round calendar), 16 middle schools, 20 high schools, and 7 charter schools. The school system also supports two alternative schools for middle and/or high school students, two single-gender academies, and an adult learning center. 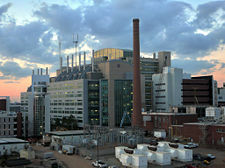 Atlanta has more than 30 institutions of higher education, including Georgia Institute of Technology, a predominant engineering and research university that has been ranked in the top ten public universities since 1999 by US News & World Report, and Georgia State University. The city also hosts the Atlanta University Center, the largest consortium of historically black colleges and universities in the country. Its members include Clark Atlanta University, Morehouse College, Spelman College, and the Interdenominational Theological Center. Adjoining the AUC schools, but independent from them, is the Morehouse School of Medicine. Suburban Atlanta contains several colleges, including Emory University, an internationally prominent liberal arts and research institution that has been consistently ranked as one of the top 20 schools in the United States by US News & World Report. The Sweet Auburn district is preserved as the Martin Luther King, Jr. National Historic Site. Atlanta features the world's largest aquarium, the Georgia Aquarium, which opened in 2005. It also hosts a variety of museums on subjects ranging from history to fine arts, natural history, and beverages. 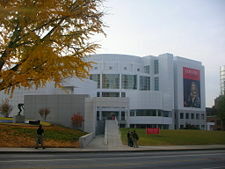 Museums and attractions in the city include the Atlanta History Center; the Carter Center; the Martin Luther King, Jr. National Historic Site; the Atlanta Cyclorama (a circular painting depicting the Battle of Atlanta) and Civil War Museum; and the Margaret Mitchell House and Museum. Piedmont Park hosts many of Atlanta's festivals and cultural events. Atlanta Botanical Garden sits next to the park. 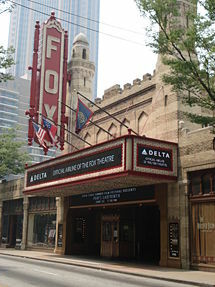 Atlanta's classical music scene includes the Atlanta Symphony Orchestra, Atlanta Opera, Atlanta Ballet, New Trinity Baroque, the Metropolitan Symphony Orchestra, and the Atlanta Boys Choir. The city has a well-known and active live music scene. 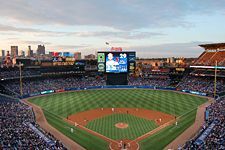 Atlanta is home to several professional sports franchises, including teams from all four different major league sports in the United States. The Atlanta Braves of Major League Baseball and the Atlanta Falcons of the National Football League, have played in the city since 1966. The Atlanta Hawks of the National Basketball Association have played in Atlanta since 1968. On June 25, 1997, Atlanta was awarded a National Hockey League expansion franchise, and the Atlanta Thrashers became the city's newest ice hockey team. In golf, the final PGA Tour event of the season that features elite players, The Tour Championship, is played annually at East Lake Golf Club. This golf course is used because of its connection to the great amateur golfer Bobby Jones, an Atlanta native. Atlanta has a rich tradition in collegiate athletics. The Georgia Tech Yellow Jackets participate in seventeen intercollegiate sports, including football and basketball. The city is growing again—in population and employment, and this growth is projected to continue at an accelerated pace: from 480,000 people in 2006 to 780,000 in 2030; and from 395,000 jobs to 570,000. From a transportation point of view, the challenge is to accommodate this growth while maintaining the quality of life desired by an increasingly diverse population. The imperative is to strengthen the connection between land use and transportation. The Connect Atlanta Plan seeks to accomplish this overarching goal. Its recommendations include building 95 miles of rail transit and high-frequency bus transit, adding 200 miles of bicycle lanes, some new streets to better connect the existing road network, and road widening projects. But funding must be found, including from state and regional sources, which is going to be a challenge in a recession. But not all areas of the city are prospering. As part of the Neighborhood Stabilization Program, Atlanta was allocated $12.3 million in 2008 to help acquire and redevelop foreclosed properties that might otherwise become sources of abandonment and blight. 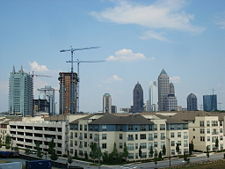 One of the areas experiencing rapid growth is Midtown Atlanta, which includes about one-third of the city's high-rises. As residents begin to return to the city following decades of suburban retreat, Midtown offers an attractive mix of amenities and attractions, as well as proximity to downtown offices and destinations. A new bridge over the Downtown Connector connects Midtown to a new multibillion-dollar mixed-use development called Atlantic Station, on the former site of the Atlantic Steel company, which has been transformed into the site of new housing, office, and retail space after years of decontamination. With a 7,300-space parking garage underneath, the shopping area is pedestrian friendly, and many of the streets are often closed off for special events. Violent crimes, however, increased by 7 percent from 2006 to 2007, with the city recording its highest number of murders and aggravated assaults in four years, according to statistics released by the FBI. Property crimes rose 12.4 percent in the same period. The numbers of violent crimes and murders also rose in most of metro Atlanta's largest counties. ↑ "Hotlanta" and "The ATL" in "Love it or loathe it, the city's nickname is accurate for the summer", Atlanta Journal-Constitution, June 16, 2008 Retrieved March 9, 2012. "The ATL" in Jeff Campbell, Lonely Planet:USA, p. 401 Retrieved March 9, 2012. ↑ "Atlanta May No Longer Be the City in a Forest", WSB-TV Retrieved March 9, 2012. ↑ Our Georgia History. Georgia's Forts Retrieved December 18, 2008. ↑ Atlanta Business Chronicle. June 24, 2008. AeA ranks Atlanta 10th-largest U.S. cybercity Retrieved December 18, 2008. ↑ Watershed Publishing. September 22, 2007. Nielsen Reports 1.3% increase in U.S. Television Households for the 2007-2008 Season Retrieved December 18, 2008. ↑ US Census Bureau. Atlanta city, Georgia Retrieved December 18, 2008. ↑ Les Christie, April 5, 2007, Atlanta tops in population growth CNNMoney.com. Retrieved December 18, 2008. ↑ Rob Gurwitt. July 2008. Atlanta and the Urban Future Governing Magazine: Atlanta and the Urban Future. Retrieved December 18, 2008. ↑ Ed Lightsey, January 2007, Trend Radar January 2007 Georgia Trend. Retrieved December 18, 2008. ↑ The Brookings Institution. November 2003. Atlanta in Focus: A Profile from Census 2000 Retrieved December 18, 2008. ↑ Roman Catholic Archdiocese of Atlanta. Archdiocese of Atlanta - Statistics Retrieved December 18, 2008. ↑ Peggy Mihelich, November 23, 2005, Big window to the sea CNN.com. Retrieved December 18, 2008. ↑ Connect Atlanta Plan. What are the goals of the Connect Atlanta Plan? Retrieved December 15, 2008. ↑ Mike Morris, September 15, 2008, Metro Atlanta had increase in crime in ‘07 The Atlanta Journal-Constitution. Retrieved December 15, 2008. Allen, Frederick. 1996. Atlanta rising: the invention of an international city, 1946-1996. Atlanta: Longstreet Press. ISBN 1563522969. Craig, Robert M. 1995. Atlanta architecture. Gretna: Pelican Pub. ISBN 0882899619. Garrett, Franklin M., and Harold H. Martin. 1954. Atlanta and environs. New York: Lewis Historical Pub. Co. ISBN 0820309133. Roth, Darlene R., and Andy Ambrose. 1996. Metropolitan frontiers: a short history of Atlanta. Atlanta, GA: Longstreet Press. ISBN 1563522845. Sjoquist, David L. 2000. The Atlanta paradox. The multi-city study of urban inequality. New York: Russell Sage Foundation. ISBN 0871548089. Stone, Clarence N. 1989. Regime politics: governing Atlanta, 1946-1988. (Studies in government and public policy.) Lawrence: University Press of Kansas. ISBN 0700604154. This page was last modified on 23 April 2016, at 20:48.